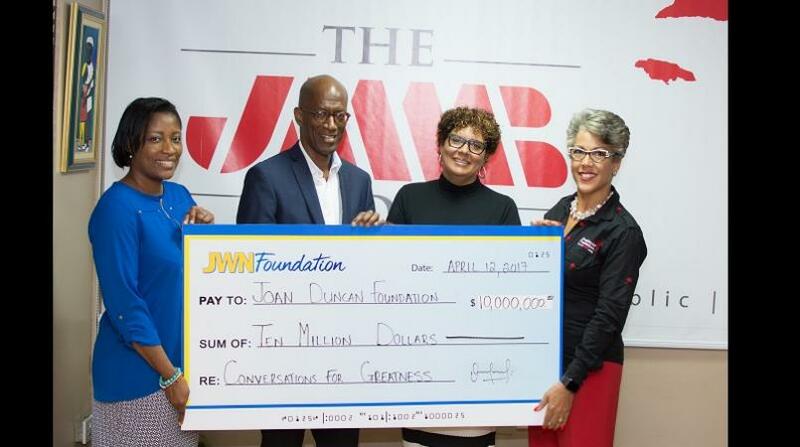 JWN Foundation has invested J$10 million, in cash and kind, in the JMMB Joan Duncan Foundation-led transformational project dubbed, Conversations for Greatness (CFG). This philanthropic partnership is expected to positively transform the lives of hundreds of Jamaican youth and school leaders across four schools in Kingston and St Elizabeth. The programme, spearheaded by the JMMB Joan Duncan Foundation, is aimed at inspiring school teachers, administrators and other support staff to become transformational agents and, in so doing, assist in the improvement of primary and secondary schools that are performing below the national average in English and Mathematics, according to the most recent report from the National Education Inspectorate. Conversations for Greatness will be implemented in approximately 150 schools, island wide, over a three-year period. The merits of the programme have already begun to be realised in several schools across the island. Donald Quarrie High School (a participant in the pilot transformational initiative), has recorded significant reduction in the behavioural challenges experienced among students and has seen a decline in absenteeism since the school’s involvement in Conversations for Greatness. The JWN Foundation, with a desire to replicate the success experienced at the Donald Quarrie High School, through the Conversation for Greatness project, has adopted four schools within the communities that J Wray & Nephew Limited operates. These include Penwood High School and Haile Selassie High School in Kingston and Maggoty High School and Roger Clarke High School in St Elizabeth. Thus far, members of the JWN staff have begun to participate in the training sessions, dubbed “conversations”, to provide them with the requisite knowledge, principles and practical experience underscoring CFG, in preparation for the in-school sustainability aspect of the project. efforts of the school through their leadership team and support staff, in addition to providing one-on-one coaching to the schools’ principals. The JMMB Joan Duncan Foundation has rolled out the programme in 19 schools in several parishes including: Kingston and St Andrew, Clarendon, St Elizabeth, St Catherine and St Ann. (From left) Tanikie McClarthy Allen, board director and Clement ‘Jimmy’ Lawrence, chairman of JWN Foundation, present a symbolic cheque for $10 million to Patricia Sutherland, chairman and Kim Mair, CEO of the JMMB Joan Duncan Foundation.